Look, it’s been a busy few weeks. First up, The Curious Story of Malcolm Turnbull: the Incredible Shrinking Man in the Top Hat is out through Allen & Unwin, on shelves and being bought by people. It was launched last week at Better Read Than Dead in Newtown and it went very well, thank you. Every home should have this wall. My columns are still columning away at the Sydney Morning Herald, trying to make sense os what the hell is going on in politics and the nation. The Guardian very kindly included The Curious Story of Malcolm Turnbull in their round up of the best books of the month, along with excellent pals and colleagues including Holly Throsby (whose novel Goodwood is magnificently quirky and fascinating), Clementine Ford (whose Fight Like A Girl is deservedly already a bestseller) and Lee Zachariah – who, as it happens, appears on the new episode of the Double Disillusionists podcast, which is up at Soundcloud and iTunes! 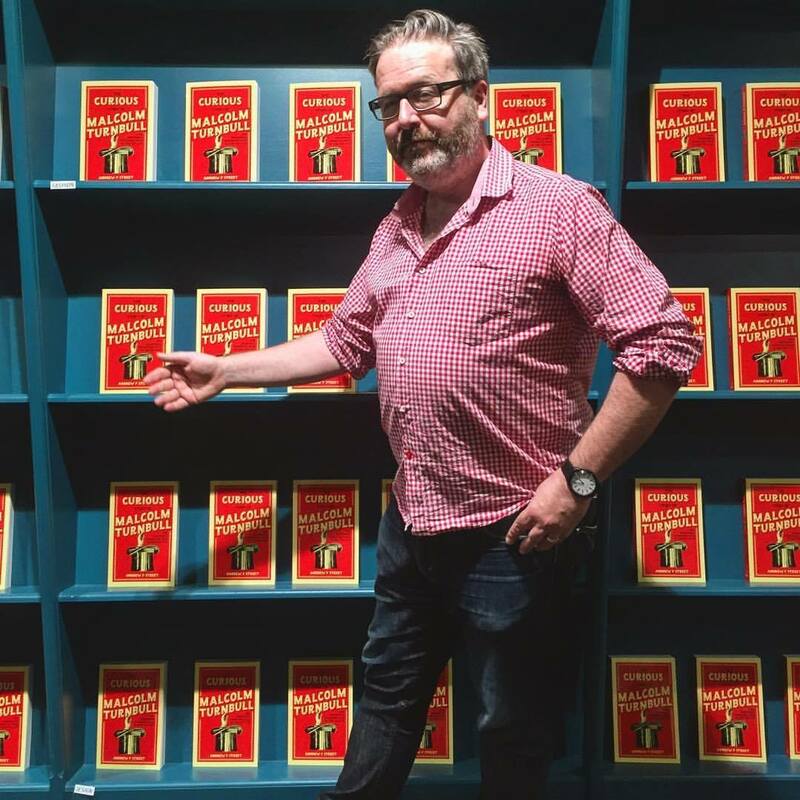 Dom and I talk to Zachariah about his simultaneous coverage of the election campaign and the collapse of his marriage, as illustrated in his very entertaining book Double Dissolution. Which you should read. Also, he’s very funny (so you should listen to it right now, frankly). On a completely different note, I also fulfilled a lifetime dream of writing a cover story for Rolling Stone – an extensive interview with Jimmy Barnes. It’s in the current issue, andI can’t tell you what a thrill that was. He was a fascinating gent. Anyway, there are some events coming up this week! First up, on Friday 14 October I’m speaking at Stanton Library at 1pm: you can book a spot here, and it’s actually filling up remarkably swiftly. Then on Saturday 15 October I’m speaking at Littérateur: A Festival for Word Nerds at the Old Fitz, talking about the art of politics writing with the Guardian’s Gareth Hutchens. It’s the very first session of the day at 10am, so I’ll understand if you’re hungover. And there are more events to come. Updates will follow. Hope to see you at them, if you’re about. This entry was posted in Announcement and tagged book, events, malcolm turnbull by Tyrannicon. Bookmark the permalink.